Maybe rather than spending big telling people how good it is at helping Aussie farmers, Coles should actually pay farmers fairly for their produce. There are plenty of reports of farmers – dairy, cattle, vegetable, fruit – being paid less than a living wage for their produce under pressure from supermarkets like Coles. Donation matching is good. Paying a fair (for farmers) price is even better. Farmers, particularly dairy and grain farmers, need to own that they caused a lot of the problem. Once, their products were processed through co-ops they owned, then they bought the hype about “unlocking the value” and now have no control over price or supply conditions. To consumers, milk is a commodity, they don’t care about brands, just lower prices. The dairy farmers need to go back to the co-op model so that they capture profits from higher priced lines like cheese and yogurt that can then offset the commodity pricing on milk. 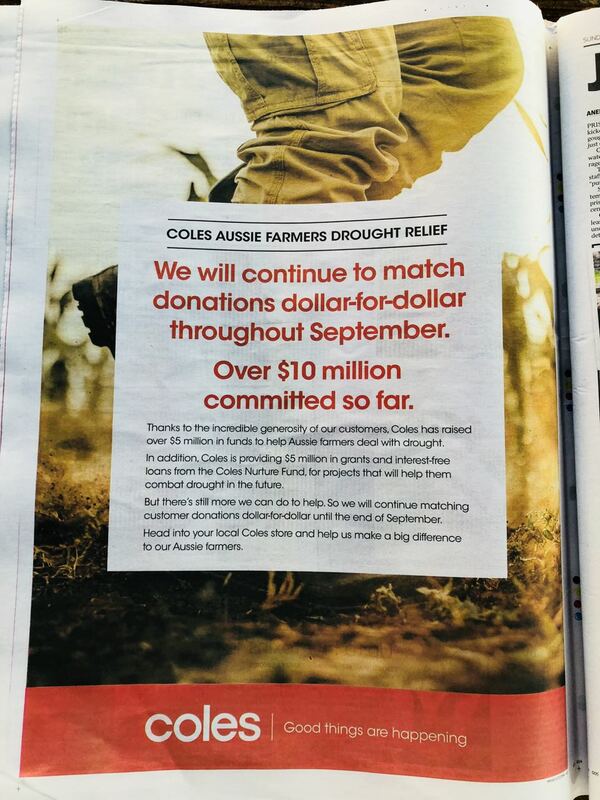 Farmers also need to stop voting for politicians who deny the reality of climate change, instead electing politicians who are concerned about science, and who will support drought proofing for farms. It’s not like nobody saw this coming.